Dec 17, 2017; Detroit, MI, USA; Stormtroopers walk on the court before the game between the Detroit Pistons and the Orlando Magic at Little Caesars Arena. 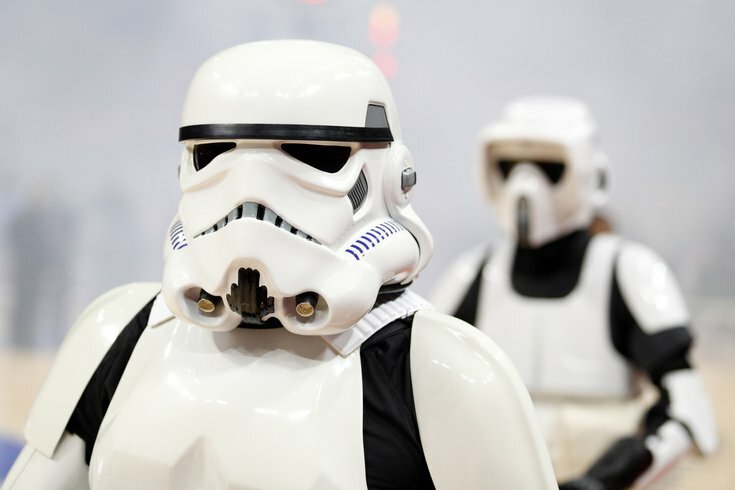 This summer, watch the first film in the Star Wars original trilogy at the Mann Center while the Philadelphia Orchestra plays John Williams' Oscar-winning score. The American Film Institute considers it the greatest film score ever written. For the first time, fans in Philly will be able to experience a symphony orchestra performing the music to "Star Wars: Episode IV – A New Hope" live. George Lucas' film will be projected onto three giant screens. The Mann will present the movie-concert on Friday, July 20. Tickets will become available to the general public at 10 a.m. on Friday, March 2.